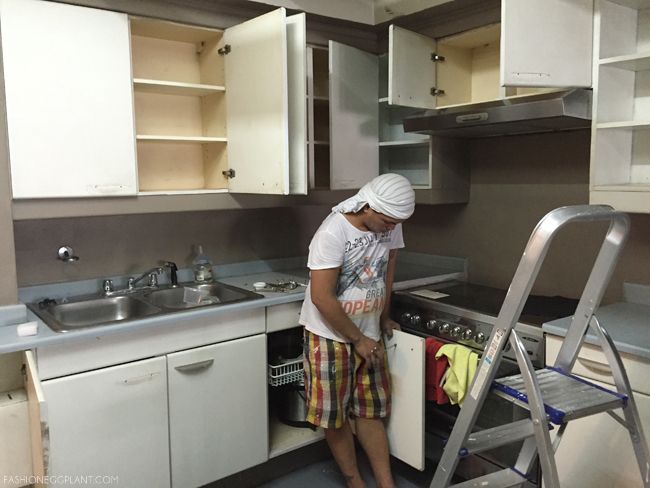 The hardest and most stressful part of our renovation was the kitchen. It took the longest to get done and was also the most expensive primarily because of the granite BUT because of our open layout, deciding to include it into our facelift at the last minute was the best decision we've ever done. I don't think our home would look as fresh or updated if we left it as is or went with our original plan of just having the cabinets painted. Like I said, the kitchen wasn't part of the plan so it came together via a weird design process. I'm just relieved they all tied in together in the end. I managed to dig out this picture from a newspaper for my Bounty Fresh feature before and it shows our old countertops which were gray laminate born in the 80's. Porous and extremely difficult to clean and maintain. Dirt just manages to seep into them. You can also still see the breakfast bar in the lower right portion of the photo. 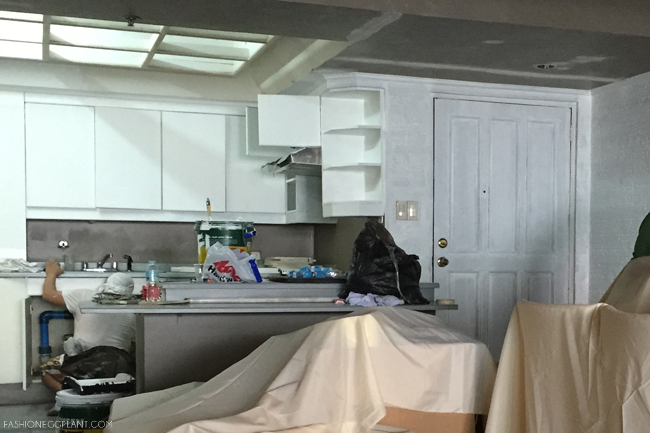 As I already mentioned, painting the cabinets were already part of the initial plan. They're in the same laminate material as the countertops. In case you have the same thing at home and want to have them painted, I'm telling you, most workers will tell you that you cannot have them done without stripping off the laminate. WRONG. 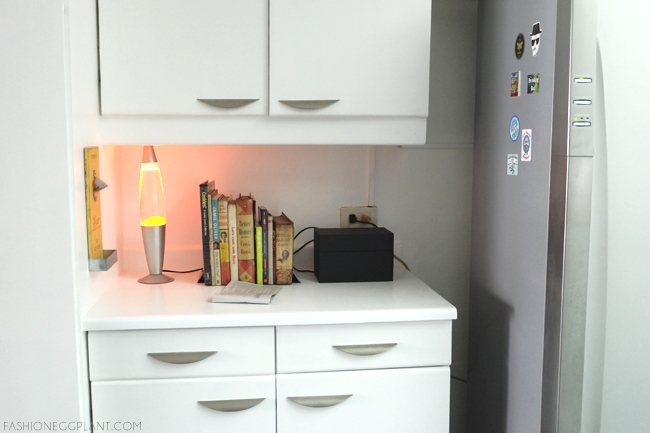 You can paint over laminate cabinets with latex paint. Just make sure to do thin coats and let them dry completely in between coats. Just be careful not to scratch them with something sharp. I'm also not sure how it's gonna pan out if you go dark to light. Same color paint or light to dark shouldn't be much of a problem though. Just like with the rest of our house, when we saw the cabinets re-painted, the old wall looked extra tired. Painting that white was out of the question because I could already imagine how dirty it was gonna look with all the grease piling up from everyday cooking so we decided to install a backsplash. 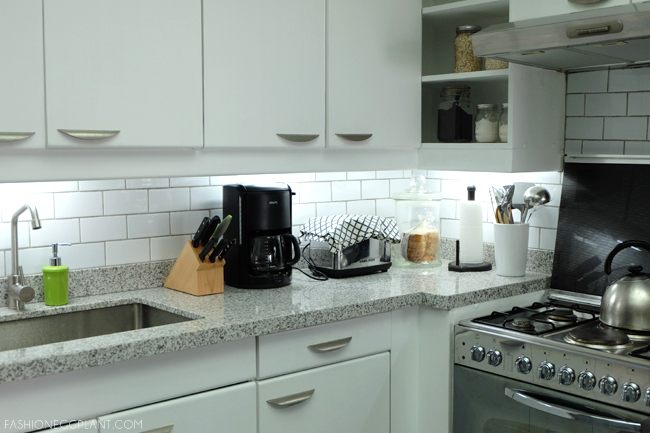 I've always wanted white subway tile so this was the perfect opportunity to have it done. Had I known how cheap it was to install a backsplash I would've done it years ago! It only cost me less than 3k for all the tile. Before work on the kitchen began, it was really in a state of wreck. Only one faucet was working and upon further inspection, we realized that the edge of our sink was already deformed and the sealant used some some decades ago was way gone leading to water damage on its wooden foundation. We could've just had it all repaired but I guess we were both sick of the old look so we both decided to change it. To what, we were still undecided but I already knew what I wanted: a large undermount sink for easy clean up. Since we were already changing the sink...it unearthed one of Dennis's biggest pet peeves which was unbeknownst to me - our countertops. He's usually very stingy when it comes to spending so he must've really hated it to suggest ripping the entire thing out. I've always wanted to get rid of those laminates so I gladly obliged and found a supplier. Good thing I have a cousin who's an architect and he was able to give us a pretty good deal with his supplier. It still cost quite a bit but at least we're sure that it's sturdy and reliable. That's really all we did. Paint + Sink + Backsplash + Counter. For Phase 2, we plan to change the cabinets. But that's when we save a bit more, we were already way over budget with this project because of all the unexpected add-ons along the way. ps. We also found out that our unit is a bit lopsided. The floor isn't level and so our backsplash came out a bit crooked on the side of the range. It was a bit annoying at first but I've learned to live with it. Also it's mostly covered by the range cover anyway so I hardly notice it. Oh I should get your carpenter's number! When we had our condo renovated, repainted, etc... it was so expensive! blah. Beautiful kitchen! I love it. Gusto ko yan naka heels habang nagluluto haha So kelan na ang house blessing mother... excited na ako! 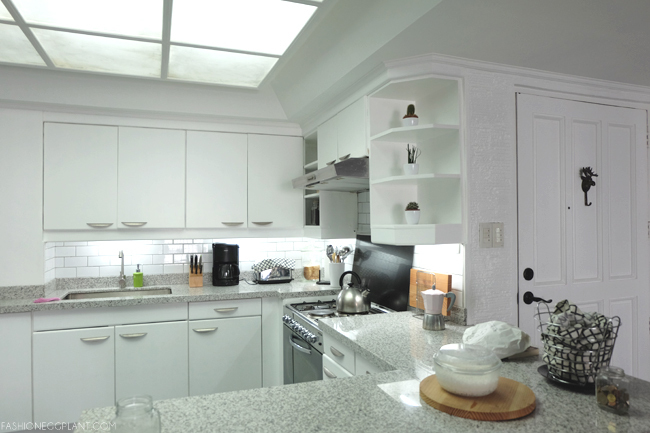 You made the right decision in updating your kitchen as it looks very nice and functional. There is really so much action going on here to neglect this area of the house. I believe more magical cooking is awaiting to happen in this beautifully designed kitchen. You have a lovely kitchen. I like the subway tiles. 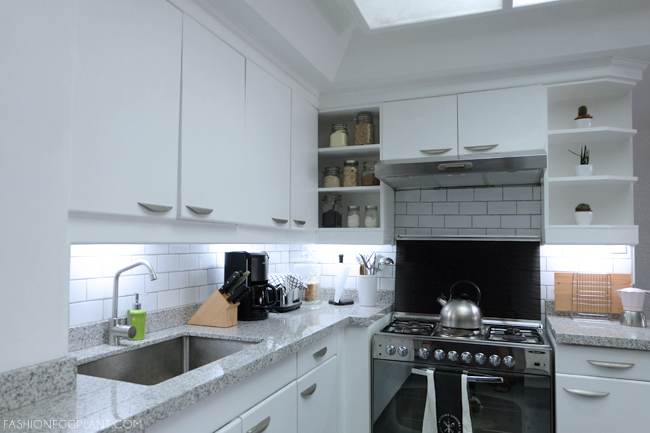 your new new old kitchen is gorgeous! i looove everything! from the countertops to the backsplash to the newly painted cabinets! 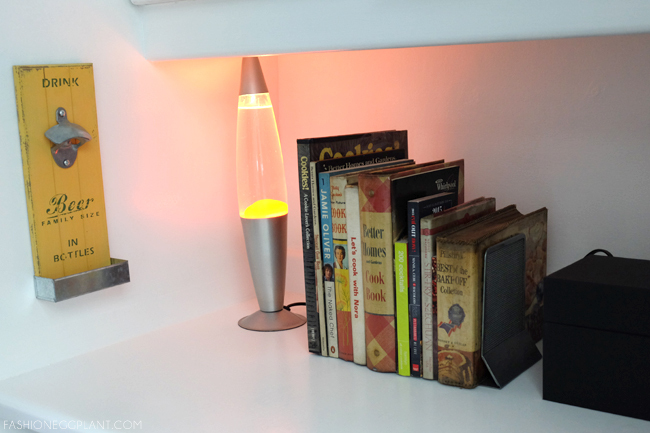 this is sooo inspiring, i cannot wait to renovate mine! I love the look of your kitchen, Sarah! I wish we have more space in our kitchen.